The full 2017-18 regular-season schedule is being finalized and will be announced next week. The 2017 #NBAXmas Day Schedule! The first four days of the season (Oct. 17-20) will feature 14 different teams playing eight national television games as part of Kia NBA Tip-Off 2017, with TNT and ESPN airing two doubleheaders each. Last edited by dirt_dobber; 08-10-2017 at 06:36 PM. Tuesday, October 17th's NBAonTNT Schedule! Last edited by dirt_dobber; 08-10-2017 at 06:33 PM. That's a lot of games I won't be watching... No Uber, no Woodslanger, no interest. Last edited by Underdog; 08-10-2017 at 07:48 PM. I'd be pissed if I bought tickets to see super stars and got a team full of subs. Once you realize the stars are not playing, would you even tune into the beginning of the game? I could see me checking on it later and then if it's close at the end, I would watch. But how is that different than only watching the beginning until they are up by 40 points? I guess it comes down to when are the ratings calculated for reporting purposes. I'd be pissed too if I bought tickets to see 2nd/3rd stringers play... But I'd be even more pissed if the face of my franchise got injured because the NBA was forcing them to play too many games too close together. Especially if it's some meaningless game that doesn't affect the standings. If I had to make a rule (I wouldnt), it would be you can only take off home games, and it cant be nationally televised. In reality, players love that bump in salary because of the billion dollar tv deal, but dont want what comes with it (being on national tv ALOT). I like to remind myself that Wade exercised his 24 million option and Bulls will buy him out-- paying him his money to not play for them. Last edited by EricaLubarsky; 08-17-2017 at 08:22 AM. 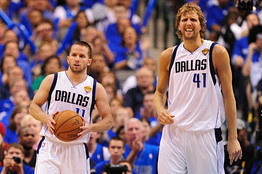 I think everyone in Mavs are saddened by Powell's contract. Especially with it running until 2020. It would be tolerable for only this season, but two more seasons make it a tough pill to swallow. I realie that Wade exercised his 24 million option and Bulls will buy him out-- paying him his money to not play for them. I hope they let him rot. But theyre in full tank mode and so probably will give in and buy him out eventually.